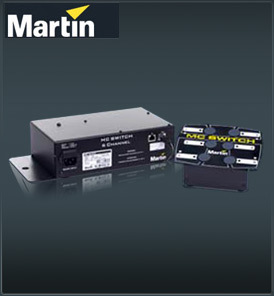 The Martin MC switch controls lights such as the Mania, egos, T-Rex, Raptor and fixtures like mirror balls. The control is a mains power on/off digital switch which is controlled via a remote control with on/off buttons. Upon linking 1 controller and switch together, the maximum distance is 20 Mtr / 66 Ft Linking multible switches to the controller, the maximum distance is 10 Mtr./33 Ft.